When Freddy Niblack answered my call, he was sitting inside his Indy Light car on the Indy 500 track and grateful to have an excuse to go inside an air-conditioned building to talk. While it was a balmy 91 degrees in Indianapolis that day, the temperature inside his car was a scorching 135 degrees. 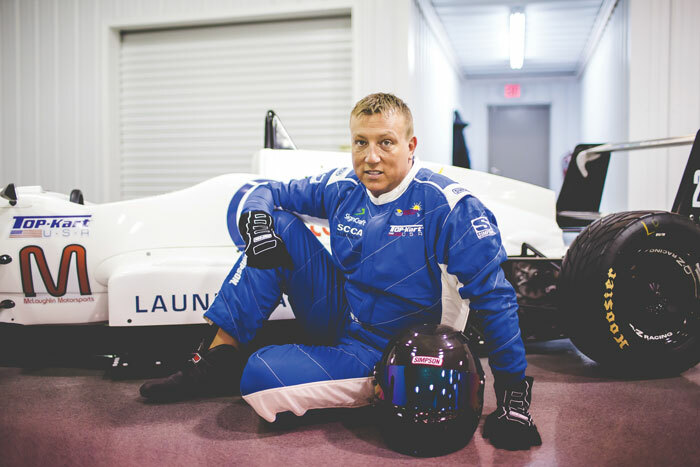 Taking a second try at a racing career at age 44, he’s currently driving Indy Light cars that have a 600 horsepower engine and move at 210 miles-per-hour (mph). For the average person it might be hard to imagine wanting to go faster than that but Niblack isn’t average. He’s hoping to move up, to fulfill his childhood dream of driving Indy Cars. Perhaps it’s not surprising for a kid born and raised in Speedway, Indiana in a house just two blocks from the Indianapolis Motor Speedway, home of the Indianapolis 500, to wind up as a professional race car driver. 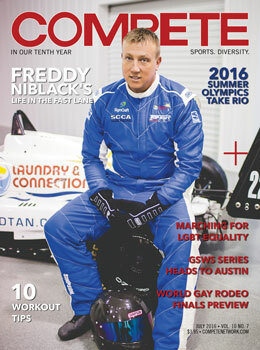 He’s the second openly gay pro driver behind Evan Darling and the first in the Indy Car Series. But what’s truly shocking is the amount of homophobia he faced from the racing community in his early career, not just in the U.S. but also in Europe. He admits he feels safer in a race car than anywhere else, even though it’s pulling 5 Gs, going over 200 mph and requires you to have the reflexes and reaction time of a road runner. There he feels calm; outside his motorized cocoon he can feel extremely anxious. Coming out as a teen, Niblack’s early career was an ongoing ordeal of homophobic discrimination that’s made it very hard for him since he says that being gay is such a small part of who he is as a total human being. It’s also been difficult because he says the gay community never attended any of his races in support of him in his early career. However, following a recent bout with cancer and seeing the LGBT community finally coming together to support marriage equality, the urge to compete came back. This time he has two ally heroes supporting his decision – Allen Berg, professional race car driver and president and chief instructor of the Allen Berg Racing Schools, and Niblack’s pal and fellow foodie, Al Unser Jr., now a retired Indy driver like his famous father and namesake. Now racing for Indianapolis-based Top Kart USA who hired him just because of his driving skills, for the first time in his 22-year career he feels welcome. He recently had JJ Gufreda, president of GEI, Inc. (the first transgender-owned company certified as LGBTBE by the National Gay and Lesbian Chamber of Commerce) show up at the track just to support him. Niblack is big on “taking your place,” on knowing where you belong and having the courage to show up and take it. He urges the gay community to take its place, to be supportive and proud of its own people. Deeply touched by the way the LGBT community united to respond to the recent Orlando massacre with love and caring for its own, he’s filled with pride to be a gay trailblazer for young racers coming up. As he’s supporting the community, he also says that he and other trailblazers need community support, too. He was at a Road America race in Elkhart, Wisconsin when he heard about the shootings, and the feeling of fear came over him again. Saying that his tears wouldn’t stop, he looked out at the crowd and wondered which one might be a sniper; having come so far, how hard it was to go back to the feeling of being persecuted simply because of your sexual orientation. Thankfully, this current experience is very different from the first part of his racing career. In 1992 during competition for the mini Indy series someone put a note on his race trailer that said “AIDS cures fags,” an act that led the team owner to drop him from the team. Then at another race he had a wreck and was injured. The man he was dating at the time rushed over to make sure he was alright and kissed him. The picture went viral and he was once again not wanted since he had “shamed” the team. Homophobia was just as rampant there. But no other act has been as egregious as his experience in London. Racing at 190 mph, after a number of laps his car was acting funny and then it flipped over, injuring Niblack. He later discovered that his racing team had intentionally installed a faulty gear box in his car and taken $50 bets on how long he could drive it until he’d lose control. When he crashed, no one from the team came out to see how he was, they didn’t try to include him in a team picture – in fact, they packed up the van and drove away, leaving him behind to take a bus back to London where he spent three-and-a-half weeks in the hospital. His parents flew over and brought him back home. The incident was settled in a lawsuit where names can’t be mentioned, but by that point Niblack decided to quit racing. A real life version of Speed Racer, the animated cartoon series of the 1960s, Niblack says while other kids were playing air guitar, he was driving an air wheel to mimic his life-long desire to race in the Indianapolis 500. Born in May, the month of the iconic Indy 500 and all the accompanying trials, his mom said all she had to do if he was fussy as a baby was to put him outside on the porch where he could hear the noises coming from the race track; Niblack still calls the sounds of a motor his lullaby. Although he knew he wasn’t interested in girls growing up, he felt the pressure of being traditional and had a son at 18 and a daughter at 21. Feeling like he was living a lie, at age 26 he finally had “the talk” with his mother who advised him to always hold his head up high and be appropriate. He loves being a father – his kids are his life and they spend a lot of time together. And he’s already proven to be the over-the-top grandfather to his three-month-old grandson, Easton. Telling his daughter that he’d pick him up from daycare one day, he dressed Easton in a driving suit and helmet, sat him in a baby-sized race car and had pictures taken of him drinking Pepsi. Although he’s not looking at Indy Car races until next year, Niblack is scheduled to race 12 more times this summer. The truth is that racing is sponsor-driven and he’ll need more support to hit that Indy Car level, so go to his races if you can, like him on Facebook – you can even buy real estate (ads) on his car if you’re inclined to do that. Get to know this grownup speed racer and I’m sure you’ll be another new fan, just like me.